Lake Nokomis in Minneapolis is home to the U.S. Pond Hockey Championships. What's the big deal about the AMP Energy NHL Winter Classic game between the host Buffalo Sabres and Pittsburgh Penguins being played outdoors? After all, it's just one game. Try hosting an annual outdoor weekend tournament with more than 160 teams like Fred Haberman will do next month for the third time. The third annual U.S. Pond Hockey Championships are scheduled for Jan. 18-20 on Lake Nokomis in Minneapolis. The tournament is divided into four groups, Open, Women's, Seniors and Rink Rats. Nearly 2,000 players will participate. Brian Bonin, the 1996 Hobey Baker Award winner, will participate again. Ex-NHLer Tom Chorske is on Haberman's team. Registration is closed this year for all divisions, except the women. "We've got 160 Open Division teams, 20 Senior Division teams, 40 Rink Rat Division teams and only five women's teams," Haberman said. "We post the rosters on our Web site and I think women look at the names of the players and get discouraged. Guys, on the other hand, see some prominent player's name and think, 'I'd like to take that guy on.'" Every team in the U.S. Pond Hockey Championships is guaranteed four games, two Friday and two Saturday, within its five-team division. Division winners then play Sunday until eliminated. The champion will play five half-hour games on Sunday. Each game in the tournament consists of two 15-minute halves. Teams play four-on-four with a maximum of two substitutes. There's no checking, no slap shots, no nets and no goalies. If a defending player tries to divert a goal-bound shot, he must be moving at the same time. The goal is six-feet wide, marked by a pair of 2-x-4s, but you can only sc. Penalties are called by an off-ice official. Each minor penalty results in an awarded goal. Major penalties are grounds for individual disqualification and the team plays down a man for the rest of the tournament. Haberman said most teams play in a diamond formation, one man in a defensive role and one floating up ice. Goals only can be scored from the offensive half of the rink. "This is backyard hockey writ large," said Haberman, still somewhat surprised by the success of his tournament, which makes charitable contributions each year to the Herb Brooks Foundation, the Minneapolis Park Board and the Dynomights, an inner-city hockey program the NHL also has supported. 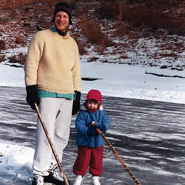 "I've been playing pond hockey my whole life," Haberman said. "We had a backyard rink. In Minneapolis, you go out and see people from age 3 to age 80 playing. I'm almost 40 and some people say this is my mid-life crisis. I was just looking for something to do that I could be passionate about. We have a lot of lakes in Minneapolis. The first year, we were at Lake Calhoun and last year moved to Lake Nokomis when it looked like it would be too warm for Lake Calhoun to freeze. They had open water there and eight inches of ice on Lake Nokomis. It's also a bigger park with more room for parking and spectators." Haberman's event isn't the only pond hockey event on this side of the pond. Danny Braun directs the World Pond Hockey Championship in the thriving metropolis of Plaster Rock, New Brunswick, pop. 1,300. 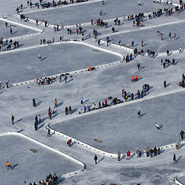 But the town will come alive Feb. 7-10, 2008, when about 120 teams will hit the ice on Roulston Lake's 20 rinks. The tournament drew 8,000 people last year. Each team is guaranteed at least five games -- one Thursday and two each Friday and Saturday. The top 32 teams will play in a single-elimination tournament Sunday. While the tournament draws mostly from New Brunswick, Nova Scotia, Prince Edward Island and Maine, 35 states have been represented as well as 15 nations. Even the Cayman Islands in the Caribbean has sent a team. Pond hockey is an event that crosses generational lines. Braun, Plaster Rock's Director of Community Development, is one of the event's founders, and he posted on the tourney's Web site a nice thank-you letter from contestant Brian Whitehead of Thunder Bay, Ont. That's a 1,450-mile drive or 28 hours on the Trans-Canada Highway. Whitehead recalled his early days of playing hockey on a pond in the city's Fort William section. "The games would start right after school and we would play until the bells on the United Church would ring at 5:45 p.m. The bells were the signal for someone to announce 'next goal wins.' At this point, we would score and head home before the bells finished ringing at 6 p.m. The game was simpler back then. We settled our own disagreements. The players respected the game and each other. Smaller, younger and weaker players were protected. We did not require Officials and we definitely did not require Administrators. We did not require Administrators creating structure for us. If the score in any one game became one-sided, we would stop the game, 'trade' a few players and balance the teams. Too simple." The World Pond Hockey Pond Championship retains many of those values. "It's four to a team, no goalies," Braun said. "Helmets are not required but recommended. Guys wear shin pads under sweatpants. Some wear elbow pads. We don't have officials but there's a monitor on every game. You don't sit out a penalty, it's an awarded goal. It's old-time hockey, pretty much. There's two 15-minute halves. If you get scored upon, you bring the puck up and the scoring team has to wait for you to bring it up past center ice. "There's no division, just 19-year-olds and up in one open division. We have varying skill levels, from recreation-level players to former pros. One thing they have in common is that it's something they all did as kids on a local parking lot, pond or river. It's pretty relevant to what they did as children." Something very good has come of the World Pond Hockey Championship. "We were in the midst of a fund-raising campaign to build a new community rink and we cleared a 3,000-x-300-foot sheet on the Tobique River to host snowmobile races," Braun said. "We filled all the hotels and restaurants but we didn't make any money. So we agreed we should try something else. A hockey tournament came to mind right away and five minutes later I had the basic structure and it took off from there. We have 200 volunteers and an annual budget of about $140,000. "The tournament has helped us reach our goal," Braun said. "Last month, we opened the Tobique-Plex, a facility with a North American standard-sized rink, 200-x-85-foot ice surface. The building has dressing rooms with showers, a fitness center and a walking track." Braun's dream has succeeded beyond his wildest dreams. Despite the $500 cost to enter a team, he receives about 800 applications annually and holds a lottery to determine the 120 teams that will be admitted. Pond hockey can stir the soul. Some of my favorite childhood memories are of skating with friends at Ware's Cove in Auburndale, Mass., sometimes in below-zero temperatures. Like Whitehead, we looked over those adult boards at well-known and revered players like Olympic gold-medalist Billy Cleary, a few of his Harvard buddies, the McLaughlin brothers and future San Francisco Giants shortstop Donnie Mason, who brought state and New England championships back to Newton. Similar memories drove Andrew Sherburne and Tommy Haines to make the movie, Pond Hockey. "Believe it or not, I went to a St. Paul high school, Central, that didn't have hockey but we were famous for alumni Charles Schultz of Peanuts fame and Dave Winfield," Sherburne said. "Tommy is from the Iron Range so he played a lot of hockey. "When the U.S. Pond Hockey Championships started, we thought it would make a great subject for a film. The more we got into it, the more we realized that this is a much bigger story than just this tournament. We started connecting with former Olympians, professionals and college players to see what made pond hockey special to them. "We're seeking distribution and putting the final touches on it now. We were at the tournament in 2005 and 2006, and the second year is the one we follow in the movie. Brian Bonin makes a passionate statement in the movie about playing outside. We visit with Neal Broten and talk to journalists John Buccigross and Jack Falla." Sherburne summed up the essence of pond hockey in a few short words. "You don't need a uniform to have fun in hockey, just a stick, a puck and a pair of skates."